John, Paul and Conrad all shared a passion for the same machine and met up after over five decades of combined ownership. In November 2015, Paul Barker of Shrewsbury, was looking through an old file and came across the original beige registration document for his Lambretta – he has been riding the TV since 1965. His brother John had originally bought it in December 1962 for £65. Paul noticed the name of the very first owner, Conrad Morris of Swansea, and wondered if he was still around. Janet at Westbourne Grove, Swansea. A quick look on 192.com showed that there was indeed a Conrad Morris living at a Swansea address. 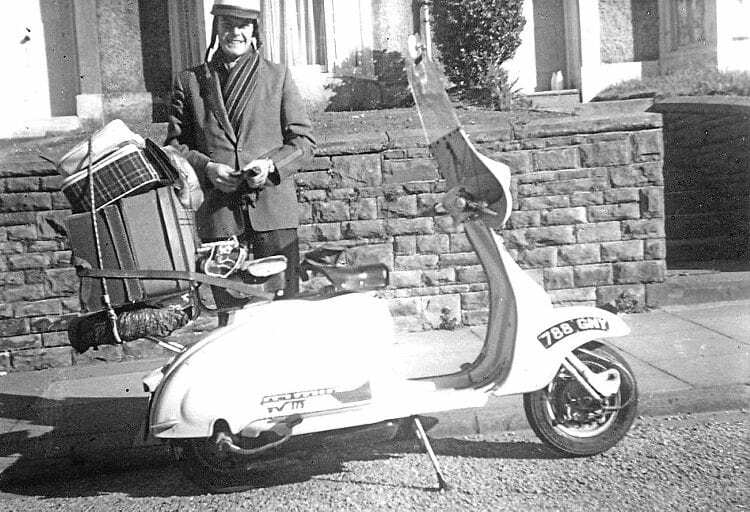 So Paul made a note of it and sent him a letter, including a black and white photo from 1964, asking whether he was the original owner and informing him that the scooter was still in regular use. He was delighted to receive a reply the following day from Conrad who was the right man and who had been thrilled to receive the letter. Conrad had bought the TV brand new in May 1960 from dealer Fred Rist of Neath for £170. The purchase represented about half his wages on HP. The price included three accessories: a full screen, two single seats instead of a dual and a flat rear rack which is still on the scooter, tax and insurance. Conrad was a single police constable with a steady girlfriend and the scooter’s first home was in the yard of the Central Police Station where he was based and lived. Conrad got married to Janet Morris in September 1960, the pair having been an item since they were just 13 years old. For their honeymoon they rode the scooter from Swansea to Edinburgh and got stopped for speeding in Preston while overtaking a Vespa. The policeman let them off when he found out they were on their honeymoon, not knowing that Conrad was also a policeman. In the photo of them setting off, Conrad looks like ill-fated gentleman explorer George Mallory, going up Everest with only his tweed jacket for protection from the elements. Like Paul, Conrad usually had a basket on the rear rack but also carried a Remington portable typewrite which he used in the Doctor Who’s TARDIS-style police boxes. Conrad about to set off for Scotland, September 1960. Paul had an exchange of emails and photos with Conrad before finally speaking on the phone as their lives were entwined in so many ways. Paul decided to take the scooter to Swansea for the annual Transport Festival last June and do the Coracle Run to Carmarthen with his wife Rebecca. 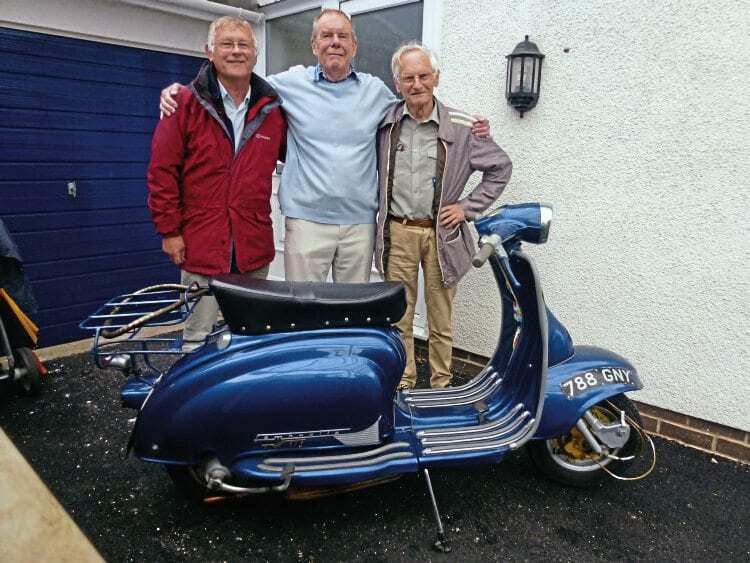 Conrad met them at the starting line and so was finally reunited with the Lambretta after 53 years apart. He later said that he had smelt it before he saw it. 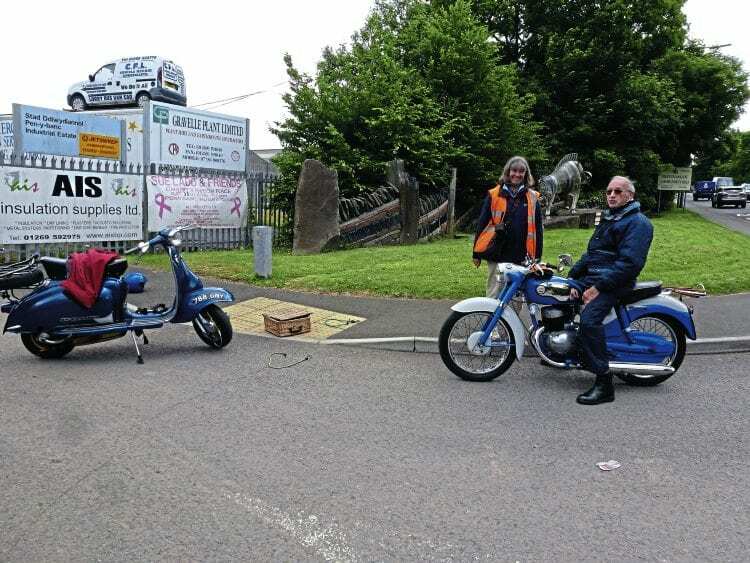 There was the slight inconvenience of a rear tyre puncture en route to Carmarthen but otherwise they had a good run and in Ammanford met up with John Sheen, who was out for a spin on his immaculate James 350cc motorbike. 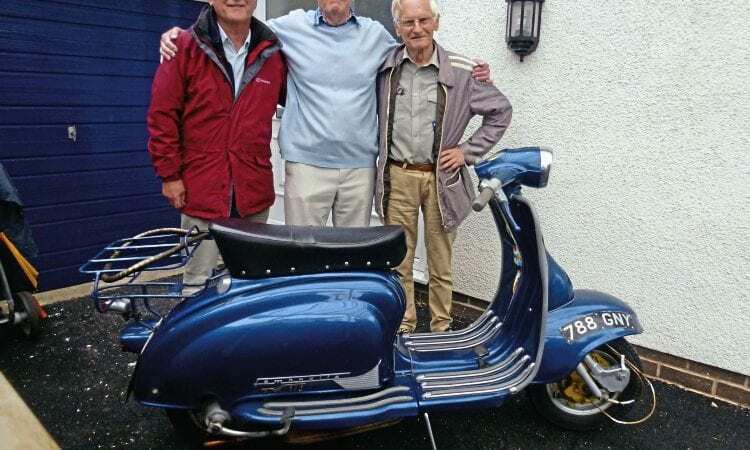 They had first met at the Tenby Scooter Rally when they were on their Li Series 2. John Sheen and Rebecca near Ammanford, June 2016. 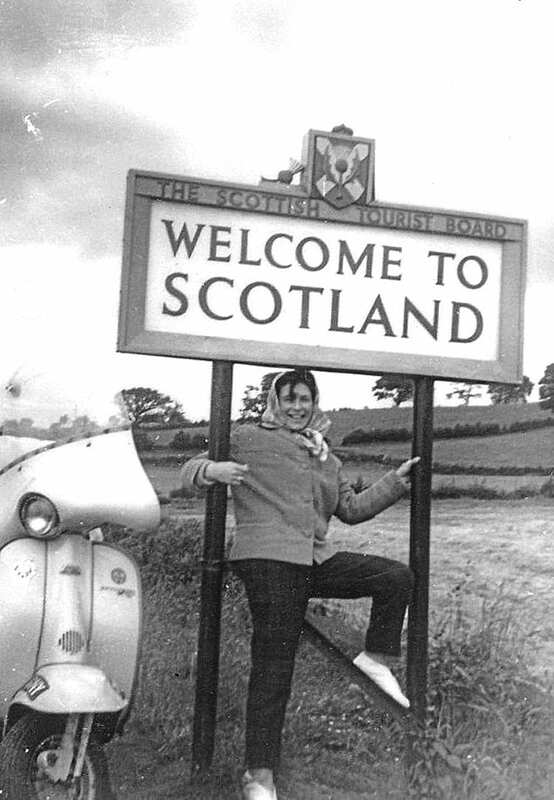 John and Eileen are another couple who took their Lambretta on honeymoon, this time to Ireland in 1959 from Fishguard. 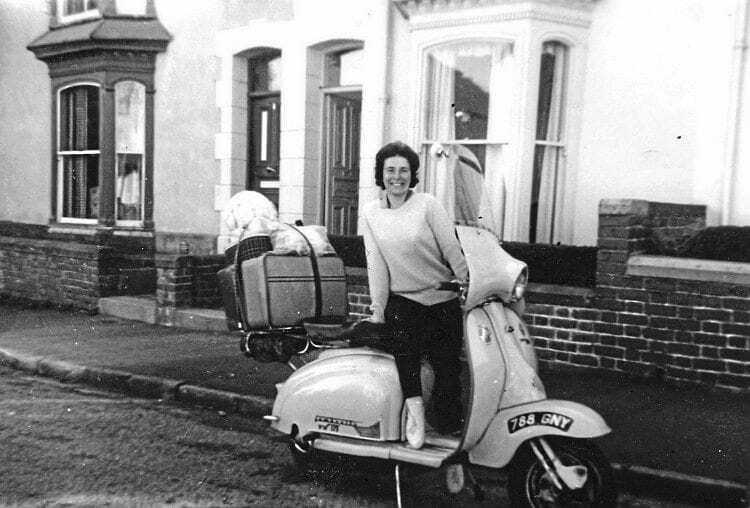 It was a clandestine operation as Eileen’s father did not want her to ride pillion, so John took the scooter to Fishguard before the wedding which they then reached travelling by train. Paul, Conrad and John, June 2016. The following day was very wet and Paul took the scooter to Conrad’s home to meet his wife Janet. Paul’s brother John had also travelled to Swansea from London for the occasion. They managed to find a dry spot for a photo of the three owners under the car port of Conrad’s grand-daughter who lived close by. Rebecca at Avignon, July 2013. 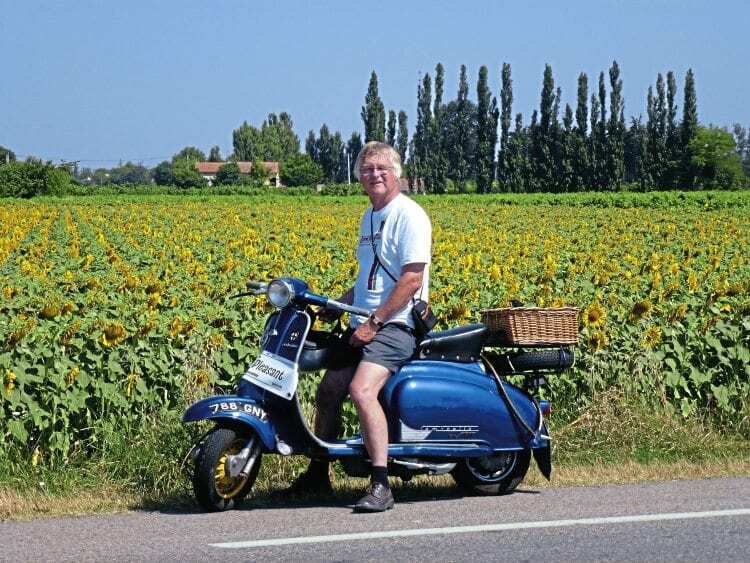 In July 2013 Paul and his wife Rebecca too the scooter back home to Italy in the back of their ancient Renault Espace. They enjoyed riding it around the Italian and French Rivieras, to Avignon, Orange and also the Dordogne and Loire Valley. Paul near Orange, France, July 2013. Paul rides with the Severnside Lions Scooter Club in Shrewsbury and has attended quite a few national rallies: Isle of Wight, Isle of Man, Weston-super-Mare, Woolacombe, Llandudno, Llangollen, Tenby and also the Goodwood Revival. The TV has now been in the Barker family 54 years and the gap in its history now filled thanks to Conrad Morris.